KPMG, the firm which could not find a £1.5bn hole in the accounts of the Cooperative Bank, have been paid by Government to produce a report which concludes that HS2 will be worth £15bn every year to the UK economy. 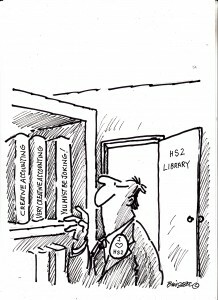 The majority of the benefits which they claim HS2 will derive to the economy are still based on the idea that no-one works on trains, and that HS2 will result in reduced transport costs which in turn make businesses more productive, due to increased connectivity to labour markets. In total, £12bn of the benefits shown in the report still completely rely on the concept that no-one ever works on trains, and therefore a cash value can be put on any time saved by quicker journeys. All KPMG have done to come up with that £12bn is say that everyone on a train only earns £35k per year, instead on £70k. KPMG previously produced a report saying that HS2 would cost jobs in Wales, the South West and even though there is due to be a station there, the East Midlands. On Monday, Transport Secretary Patrick McLoughlin refused to even say that ticket prices would be the same as current transport modes, let alone cheaper. HS1 in Kent is a premium service, compared to other railways. “Much has been made of the potential disruptions of upgrades to the WCML but of course the major upgrades have been done and the required developments to release capacity would be tiny in comparison. Indeed the disruption in converting a First Class carriage to a standard one, or from train lengthening is nothing compared to rebuilding Euston and having several platforms out of use for eight years that HS2 requires. But this pragmatic unsexy approach doesn’t fit with the need for a political legacy that is so clear in the Government’s increasingly strident defence of this white elephant.